Daydream is Google’s new plan for VR on Android. It provides the tools software developers need to make games and apps, and has close ties to existing VR tools like Unity and Unreal. The flipside to software is hardware, and Google is using Daydream to let manufacturers know which hardware specs future phones will need to be compliant with Daydream. Since Google can’t control the Android hardware ecosystem, it simply ‘validates’ devices for use on its VR platform. In Android N, Google is supporting the Vulkan API, which allows developers to have “direct control of the GPU” in a device. And this is where things start to overlap with iOS, Android and VR. Apple has a similar tool with Metal, which provides similar low-overhead access to a device’s GPU. Allowing developers to pull as much energy from a device GPU is important for gaming, because VR is heavy on processes. That’s why a Gear VR can typically go for about 30 minutes before the device overheats; it’s just hard work for your phone. As I’ve said before, there’s really good reason to think Apple is getting into the VR space for mobile. There’s indication they’re building a headset, sure, but I think there’s a version of Daydream called VRKit in the offing. Logically, VRKit will do for iOS what Daydream is doing for Android software. By giving developers a bunch of tools, Apple and Google are both encouraging a new market for mobile. While we’ve got VR experiences via Gear VR or Cardboard, neither are really top-notch. The benefit for Apple is that it controls the hardware, and can decide when VR will arrive on iOS — and if it announces VR Kit at WWDC next month, we can start considering what the specs on the iPhone 7 will be. 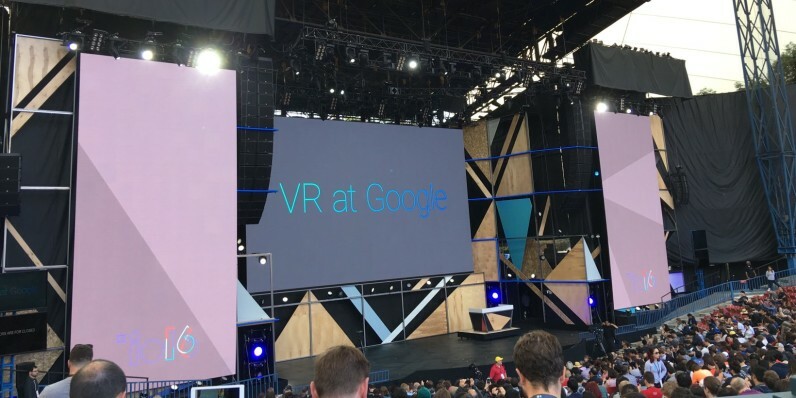 For now, Google is well ahead of Apple when it comes to mobile VR. That could (and probably will) change on a dime very soon, and both companies will be quietly working to push past one another to engage users on a new mobile front. And if we ever outgrow mobile VR, there are some really good standalone experiences via the HTC Vive and Oculus Rift. If you’re into VR, this is the dawn of a golden age. Enjoy it.